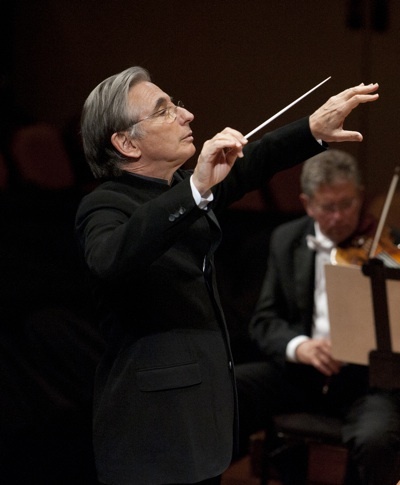 Dreams of hope and abstract love were on the menu at Davies Symphony Hall last Saturday, March 8, when Michael Tilson Thomas led the San Francisco Symphony in three works of disquieting originality. Famed German violinist Julia Fischer performed Prokofiev’s optimistic and difficult Violin Concerto No. 1, followed by Berlioz’ Symphonie Fantastique, a bizarre night-sweat of projection and idealization. Sergei Prokofiev outraged his teachers at the St. Petersburg Conservatory in 1909 by winning First Prize—and a piano—at the age of 18 with his Piano Sonata No. 1, a dissonant composition that challenged many conventions. But despite its warring tonalities, its nature was essentially romantic, with storms of emotions and rounded triplets balancing the tonal complexity. By contrast, his Violin Concerto No. 1, written in 1917 at the age of 26, is a mature work of almost sunny optimism, the work of an enfant terrible who had emerged into respect and a dream of love. Strangely, while Prokofiev was penning this violin concerto, war was breaking out all around him. It was 1917 and the Russian Revolution was in full swing: nobles were fleeing, peasants were murdering each other, and Stalin was waiting in the wings with his program of terror. Julia Fischer (pronounced Yoolia) transported us into Prokofiev’s world of yearning from her tremulous and wintry entrance to dirty low chords and hot Gypsy blood. On the way, we found high clear curls of notes like strings of pearls, sharp bow whips straight out of an Argentine tango, and even a few shrieking “Psycho” up-thrusts. But a young man’s yearning came back at the end. Against a low flute line richly played by Tim Day, Fischer returned to high curls and off-balance acrobatics, and then scaled a ladder of high notes that stretched up the violin and faded away like a morning mist. In a recent interview for German television, Julia was tasked with being a “perfectionist.” She did not deny the charge, but said that she also enjoyed taking risks. After a long ovation, she certainly took a risk when she played an encore at blistering speed, Paganini’s Caprice No. 13. She performed that strenuous bit of whimsy in that same TV interview, but on Saturday she took it at an even faster pace, and may have missed a few notes, a risk-taking that fit the young Prokofiev. Hector Berlioz was 27 when he premiered a symphony based on his unrequited love for a then 30-year-old Irish actress, five movements that sprawled his emotional mess across themes of opium, murder, and even a Witches’ Sabbath. And like that 26-year-old Prokofiev, he invented a sea of ravishing textures. MTT, tightly controlled in the Prokofiev, conducted here with so much lilt that one wondered if the musicians could follow him. And indeed, they were a little unraveled in the Reverie movement, but soon firmed up for the Waltz. In the Scene in the Fields Berlioz made clear his genius for texture: a call and response between oboe and its deeper cousin, the English horn, all against delicate pizzicatos. This broadly difficult work has a lot of naked moments, and the SF Symphony gave it a good go, with a satisfying big brass finish. They brought us there after whetting our appetites with an aperitif, the Alcott movement from Charles Ives’ Concord Sonata. Written for piano at the same time that Prokofiev was writing his violin concerto, we heard a lovely orchestral version. MTT turned to us and spoke, as it was a late addition. “This movement of the Concord Sonata (with movements named after Transcendentalists Thoreau, Emerson and the Alcott family) variously evokes the sound of the harmonium and big floating mists. It is a short piece with a big message.” That message, a gentle rebuke of Berlioz’ French Romanticism for the Deity as Nature, was a calm that felt perfectly at home with World War and young men’s passions. The SF Symphony goes on tour to Europe for the rest of March. Photo top of Julia Fischer, photo by Felix Broede/Decca; photo below of Michael Tilson Thomas, photo by Stefan Cohen.